In 1852, Tufts College was founded by Universalists who had for years worked to open a non-sectarian institution of higher learning. Charles Tufts donated the land for the campus on Walnut Hill, the highest point in Medford, saying that he wanted to set a "light on the hill." The name was changed to "Tufts University" in 1954, although the corporate name remains "the Trustees of Tufts College." After over a century as a small New England liberal arts college, the French-American nutritionist Jean Mayer became president of Tufts in the late 1970s and, through a series of rapid acquisitions, transformed the school into an international research university. Tufts is organized into 10 schools, including two undergraduate programs and eight graduate divisions, on four campuses in Massachusetts and on the eastern border of France. The university emphasizes public service in all of its disciplines and is well-known for internationalism and its study abroad programs. In 1852, the Commonwealth of Massachusetts chartered Tufts College. 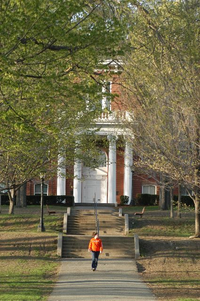 The original act of incorporation noted the college should promote "virtue and piety and learning in such of the languages and liberal and useful arts as shall be recommended." Charles Tufts was the donor of the land the university now occupies on the Medford-Somerville line. The twenty-acre plot, given to the Universalist church on the condition that it be used for a college, was valued at $20,000 and located on one of the highest hills in the Boston area, Walnut Hill. Having been one of the biggest influences in the establishment of the College, Hosea Ballou II became the first president in 1853. The official seal of Tufts College was created on July 17, 1857, by vote of the Board of Trustees. The design they adopted showed a dove with olive branch and an open Bible as symbols. "Pax et Lux," or Peace and Light, was chosen as the aphorism, with the words "Sigillum Collegii Tuftensis" meaning seal of Tufts College. The original design showed the dove of peace with the olive branch in its beak flying downward toward an open Bible resting on a rocky eminence, like a hill. The sun's rays stream through clouds in the background. A modified version of this original seal still serves as the seal of the university today. The school colors of Tufts University are brown and blue. The shade of brown is generally called chocolate brown, and the blue is variously described as between light and middle blue, or dusty sky blue. Though this color combination was chosen by the student body in 1876, the colors were not made officially the colors of Tufts University until 1960, when the Trustees voted on the matter. In Tufts' early years, a cherry-red color was informally used as the school color, but this was felt to be too similar to Harvard's crimson. In 1876, the undergraduates decided to settle the issue by establishing the colors once and for all. In the ensuing discussions, two factions emerged, one favoring seal brown and pearl white, the other, seal brown and gold. Blue was settled on as a compromise, though no specific shade of blue was singled out. P.T. Barnum was one of the earliest benefactors of Tufts College, and the Barnum Museum of Natural History (known today as Barnum Hall) was constructed in 1884 with funds donated by him. 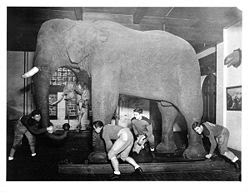 Barnum donated the building to house his collection of animal specimens and featured the stuffed hide of Jumbo the elephant. On April 14, 1975, fire gutted Barnum Hall; the collection housed in the building was completely lost, including numerous animal specimens, Barnum's desk and bust, and the stuffed hide of Jumbo the elephant. The School of Arts and Sciences. The Fletcher School of Law and Diplomacy. The School of Dental Medicine. The Sackler School of Graduate Biomedical Sciences. The Gerald J. and Dorothy R. Friedman School of Nutrition Science and Policy. The Cummings School of Veterinary Medicine. The Jonathan M. Tisch College of Citizenship and Public Service. Tufts is a member of the Division III National Collegiate Athletic Association (NCAA) and the New England Small College Athletic Conference (NESCAC), which includes Amherst, Bates, Bowdoin, Colby, Connecticut College, Hamilton, Middlebury, Trinity, Williams, and Wesleyan. Tufts does not offer athletic scholarships. Men's and women's squash and coed and women's sailing are the only Division I sports at the school. The sailing team won the 2001 Intercollegiate Sailing Association (ICSA) Dinghy National Championship and won more championships in the 1990s than any other team. Men's Squash maintains a top 20 Division I national ranking. The Tufts football program is one of the oldest in the country. The 1,000th game in team history was played during the 2006 season. Historians point to a Tufts versus Harvard game in 1875 as the first game of College Football between two American colleges using American football rules. In 1943, the Boston Red Sox used the Tufts athletic facilities during spring training due to gasoline rationing limiting the team's travel.